From left, FCMH CEO Mike Diener, FCMH Board of Trustee members Dr. Lenora Fitton, Lyn Brackens, Mark Richards, Brian Ream and Myron Priest. Not pictured: board member Carol Carey. 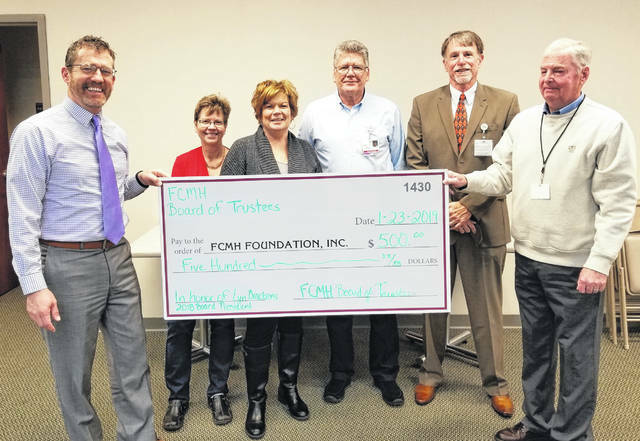 The Fayette County Memorial Hospital (FCMH) Board of Trustees recently made a donation to the FCMH Foundation in honor of 2018 board president and retiring board member Lyn Brackens. Brackens has served on the board since 2004 and says she decided to serve as a trustee because she believes that serving the community in any positive way is a good thing to do. Fayette County Memorial Hospital is a 25-bed, critical access hospital with over 30 health care providers and over 400 employees. FCMH offers a full spectrum of health care services, including same day care, specialty clinic, surgery center, therapy services and women’s wellness center. The mission of the FCMH Foundation is to forge the future of Fayette County Memorial Hospital by increasing awareness of needs and raising funds. The 501c(3) is governed by a 15-member board. https://www.recordherald.com/wp-content/uploads/sites/27/2019/01/web1_1.30.2019-Brackens-Donation.jpgFrom left, FCMH CEO Mike Diener, FCMH Board of Trustee members Dr. Lenora Fitton, Lyn Brackens, Mark Richards, Brian Ream and Myron Priest. Not pictured: board member Carol Carey.